Jerky is becoming my “White Whale” so to speak. 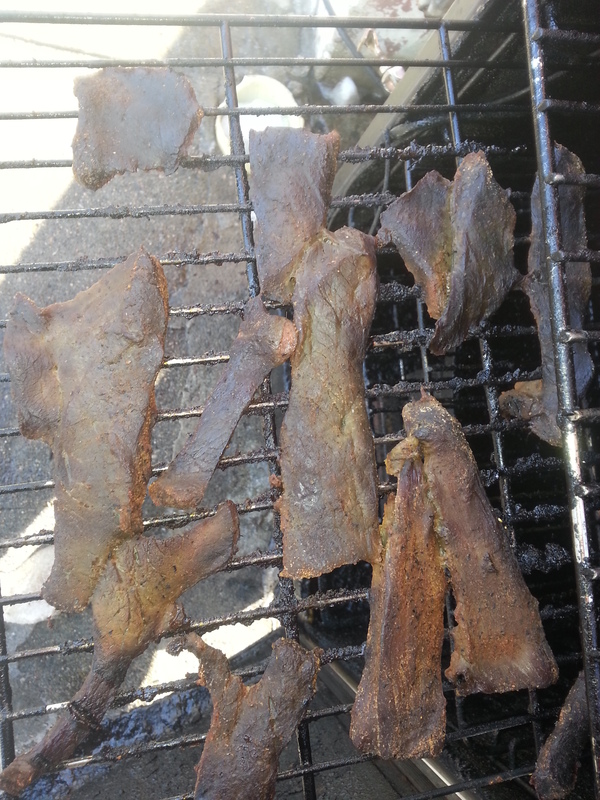 I have the process and the method down pretty good, I have a good smoky consistency, it looks and feels like jerky. What I can’t master is the flavor. I could buy some pre made seasoning, but I really like making my own. 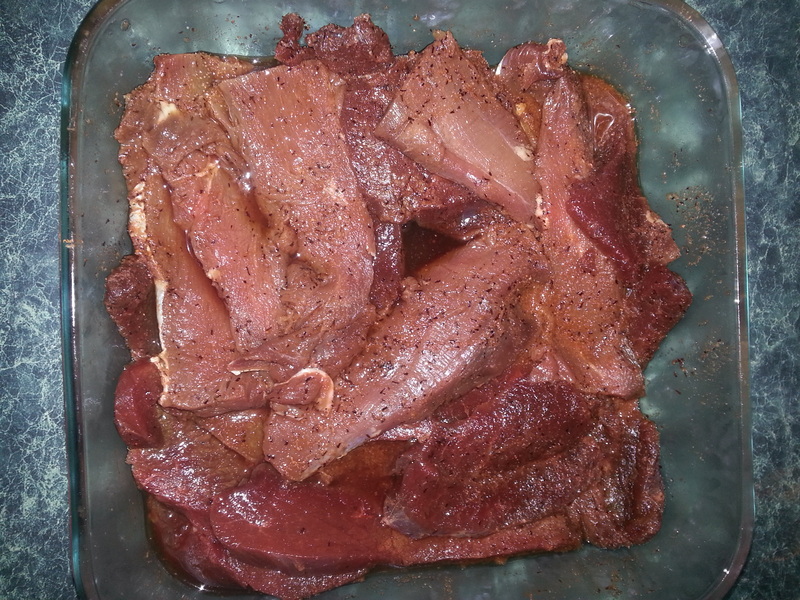 But, for this batch, a buddy gave me some of his venison to make into jerky for him, so I played it safe. For Christmas I got a 4 pack of jerky seasoning, so for this experiment in jerky making, I choose the mesquite flavoring. I also used mesquite wood chips. A big tip also is to get the shredded wood chips and the chunked ones. When you smoke at such a low temp, I have found the almost saw dust wood chips took off a lot quicker. I put the venison in the freezer for a little bit to firm it up for cutting. Once it was set, I sliced it pretty thin, and put it into a glass baking dish. I mixed up the seasoning packet into some water, and I poured it over the meat and covered it with cellophane and threw it in the fridge over night. I got up at 6 am and turned my Masterbuilt Electric smoker on to 150 degrees. 150 is a nice low temp to really get that meat dried out. I layer out the meat flat on the grates and left gaps between so smoke and air could flow between without resistance. Next time, I think I will string my metal skewers through the ends of the cut meat and let it hang down. Even though it was cold out, I mean really cold out, the Masterbuilt smoker held its temp. They are very well insulated. I don’t ever really open the smoker up until I hit the 3 hour mark. By then, if you had some thinner shaved pieces, they may be done. Go ahead and pull them out if they feel dry and have a nice dark color to them. Otherwise, close it up, throw in some more chips and head back inside. I usually add chips every hour and a half since you don’t burn through them very fast at this temp. 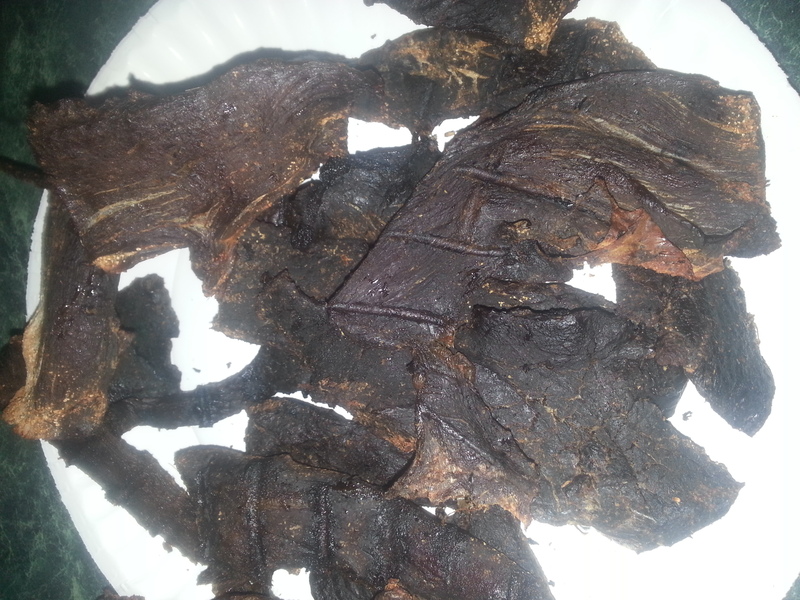 My jerky this time took about 7 hours to complete. I think the cold temps just really slowed the overall process down. The mesquite flavor was good. Now, I just need to master my own flavoring. This looks tremendous! I just got a Materbuilt electric smoker (the 30″ model) and I’m obsessed with it, I didn’t know if making jerky would be possible with it, but apparently yes! I’ll have to try this out, thanks for the how-to! Just remember, it continues to dry out for a while after you take it out of the smoker. It takes some trial and error, but I think I have it down pat now! What flavor do you want to have and where do you think your mistakes were made? I may have some Ideas for you, My favorites have been a pepper type, a teriaki(sp? ), and a sweet and spicy, I could give you recipies for those. I do have to warn you, if I do give the recipie, it is not exact, it is my own creation. Also, Hi- Mountain jerky cure(available at cabelas) have some excellent flavors and are very easy to use. You just mix recommended amounts in shaker, sprinkle on meat, mix, refrigerate in zip lock over-night and smoke. I do like to put mine on racks and dry an additional 24hrs in refrigerator before smoking. Hope this helps! 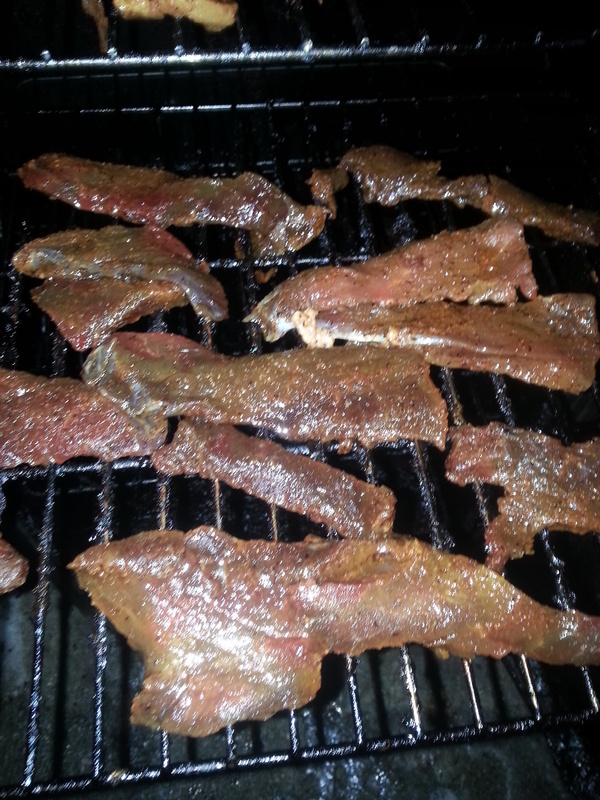 Smoking some venison teriaki right now, gotta go! Forgot to mention, I never let smoke run for more than three hours. If your jerky is tasting bitter, smoking too long could be the reason. Good tip, I will remember that! Those are awesome tips! I’m about to try a new batch, I will let you know how it goes! I’ve been looking for time and temps for deer jerky in my NEW Masterbuilt smoker! Gonna try this now! I’ve been looking for time and temps for deer jerky using a Masterbuilt smoker! Thanks, I firing up my smoker now! How did it turn out? Ever give it a whirl?